Flemish painter and draughtsman of German birth (also Johann Bockhorst). 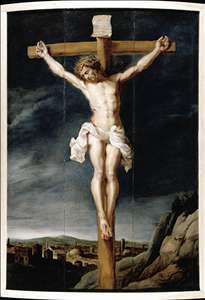 Born in either Germany or Flanders in 1604, very few of his paintings are known. Around 1626 he moved to Antwerp. According to de Bie and Filips Rubens (Vita Petri Pauli Rubenii, 1676), he became a pupil or assistant of Jacob Jordaens and Peter Paul Rubens; the style of his work bears this out. A document of 1655 reveals that Boeckhorst painted a Silenus , which was subsequently retouched by Rubens and which must have been made under his supervision (i.e. Rubens s typical workshop practice). Boeckhorst must have had a good relationship with Rubens during the 1630s, as he was one of those who contributed to the large series of paintings Rubens was then working on for the decorations of the Pompa Introitus Ferdinandi (1635; destroyed) and for the Torre de la Parada (1637-38). After Rubens s death in 1640, Boeckhorst completed his unfinished works. Between 1635 and 1637 he toured Italy, and in 1639 he returned there especially to visit Rome. As an independent painter he also executed a number of commissions in the 1630s, such as the 26 scenes, mostly biblical, for the Falcon Monastery in Antwerp, commissioned by a merchant named Gaspar Roomer. Upon his return from Italy, he created altarpieces and designed tapestries and prints. Boeckhorst also completed many historical, religious, and mythological paintings for independent buyers. See more details about "Christ on the Cross"